Though people die, and empires fall, they leave to succeeding generations their advice and legends in literature. Until recently, this literature was confined to writing; and with the invention of the printing press in 1455, thousands upon thousands of books have since been published. That was until the early 20th century, with the invention of the “moving picture.” This invention has since revolutionized Western Civilization, in many ways for the worse, as the literature of previous generations affect the decisions of succeeding generations. Gaius Julius Caesar was an esteemed politician and military general in the Roman Republic. He later brought about the end of the Roman Republic and became the first Emperor. Julius Caesar is best known for how he became emperor, his reforms in economic, political and social matters as he established the fledgling empire, and most memorably, his betrayal and murder at the hands of his comrades. Caesar was known for his military conquests in northern Europe, particularly the invasion of Britain and the Gallic Wars. His success increased his military affluence and power, and threatened the standing of his rival, Pompey, who was popular among the Senate body in Rome. “With the Gallic Wars concluded, the Senate ordered Caesar to step down from his military command and return to Rome. Leaving his command in Gaul meant losing his immunity from being charged as a criminal for waging unsanctioned wars. As a result, Caesar found himself with no other options but to cross the Rubicon… leaving his province and illegally entering Roman Italy under arms.” (Wikipedia contributors, Julius Caesar) His actions resulted in civil war, and Caesar’s triumph in that war gave him tremendous power. This power resulted in his becoming dictator, and eventually emperor. As emperor, Caesar began a series of reforms in every aspect a philosopher who happened to have been appointed dictator for life would put his valuable attention to. These reforms spanned economics, politics and even the calendar of the empire. The three major reforms attempted by Julius Caesar are as follows: the rewriting of the constitution, the construction of bridges, roads and aqueducts throughout the empire, and the Julian calendar. First, the rewriting of the Roman Constitution. “When Julius Caesar began reshaping Rome’s constitutional framework, he had three goals: suppress the resistance occurring in the provinces, unite the republic into a single unit, and establish a strong central government. Provincial conflicts ended when Caesar defeated Pompey. However, to achieve the other two goals, he needed to increase his own power.” (What were some of Caesar’s reforms? eNotes) The reforms controlled the processes by which candidates were selected for magisterial offices. This meant choosing his own supporters to fill the Senate seats, as to prevent hostility. These political reforms were not seen fully by Julius Caesar before his murder, but were instead finalized by future emperors. Next, Julius began the construction of the empires extensive road, bridge and aqueduct system, a practice that future emperors would assume as part of their duties. The roads greatly aided the movement of troops, of goods and services, the spread of news, and hundreds of years later, the Christian faith. Julius was also the first emperor to construct an aqueduct outside Rome, near Antioch in Syria. The aftermath of Caesar’s assassination was that Caesar’s cowardly friend, Mark Antony, began to wage war with Brutus and Cassius in Greece, and in the resulting civil war, Antony defeated Brutus, married Caesar’s lover, Cleopatra of Egypt, and ruled over Rome until his defeat by the great Octavian. This third civil war was ended at the naval battle of Actium, where Octavian soundly defeated Antony and Cleopatra’s navy. The losing monarchs committed suicide, and Octavian took up the name Caesar Augustus, becoming a Roman deity and the next Emperor. So, what was the legacy of Julius Caesar? During his short reign of five years as dictator, he forever ended the Roman Republic, and issued Rome into a new age of empire and conquest. He took the city out of a state of passive defense, and began the journey to it’s becoming a polished machine of world conquest that would nearly last another thousand years. He began the revisions to the constitution necessary to make future emperors have absolute, centralized power. Caesar also began the construction of roads to enable greater mobility of troops and resources throughout the empire; he constructed aqueducts through the furthest corners of the empire to establish greater prosperity in cities and enable the better growth of crops. By the time of his murder, the wheels of something far greater were already turning. Not even Gaius Julius Caesar could have seen the end of what his original plan for self-survival would have brought to his beloved city of Rome. “What were some of Caesar’s reforms?” eNotes, 16 Sep. 2016, https://www.enotes.com/homework-help/what-some-caesars-reforms-779736. Accessed 16 Oct. 2018. Wikipedia contributors. “Assassination of Julius Caesar.” Wikipedia, The Free Encyclopedia. Wikipedia, The Free Encyclopedia, 11 Oct. 2018. Web. 17 Oct. 2018. Wikipedia contributors. “Julian calendar.” Wikipedia, The Free Encyclopedia. Wikipedia, The Free Encyclopedia, 25 Sep. 2018. Web. 17 Oct. 2018. Wikipedia contributors. “Julius Caesar.” Wikipedia, The Free Encyclopedia. Wikipedia, The Free Encyclopedia, 16 Oct. 2018. Web. 17 Oct. 2018. I have a new site, which is more personalized around me, rather than my schooling. Check it out here. Thanks guys, hope to see you there. He fell. The rope that bound his wrists prohibited him from stopping his fall, and with a groan, he landed on the Roman earth. Just then, a whip cracked, adding another to the welts already crisscrossing his back. A calloused, scarred hand roughly pulled Marcus to his feet. “We’re here,” the voice said again. The very sound of that voice filled Marcus with terror, but nothing could prepare him for what he was about to witness. The soldier abruptly removed the sack from over Marcus’ head. His heart leaped in shock, and he took it all in. The sounds of cruel laughter, the cracking of the whips, the screams of agony, fear, and despair; and the deeper, angrier roaring of the hungry and imprisoned lions. Marcus shivered, knowing he and whoever else shared in his misfortune, would soon be the meal of those beasts. Before he could think on his certain doom any longer, Marcus was once again grabbed by the nape of the neck, and shoved down a dark corridor. They passed by the lions and tigers Marcus had heard, and those infuriated creatures charged at him, unheeding in their fury of the strong bars which held them back. And then, through a door, past more men just as vile in appearance and demeanor as the one now holding Marcus, they entered a large crypt. It was spacious, dirty, with barred openings in its ceiling that let in blinding rays of sunlight. He was then thrown down, and the guard left with an oath and a sharp kick to Marcus, who collapsed again with a moan. Marcus held his throbbing stomach with one hand, and pushed himself up against one of the many cold stone walls. He looked up into the eyes of a kind old man. Several more figures approached from the shadows closer to where Marcus and the old man were seated. They gathered under one of the iron barred skylights, and their eyes were full of sympathy and caring. “We welcome you,” said the man. “I only wish it were under better circumstances.” His voice betrayed to Marcus no fear or anger. Marcus was puzzled. Of all the group there, no one, young or old, showed any fear, or bitterness. “How are you all so calm?” he asked, after some discussion. The old man, who seemed to be the leader of the group, smiled. “We have all lost our earthly freedom and possessions. But one thing we still have, that the sword and the lash can never take away; and that is our faith in Jesus Christ! Remember our Lord’s promises! He said, ‘I will never leave thee, nor forsake thee.’ Oh, Marcus, where is your faith!” The man’s face was sincere, and Marcus took no thought of offense, but he did not reply. The man’s words had struck a chord, and Marcus thought intently upon what the other believers told him. The beams of light entering through the narrow skylights now began to fade, eventually disappearing entirely. The old man then led the little band in prayer, and Marcus listened intently. After it was quite dark, he fell asleep. Morning came too soon. Guards burst in, and seizing them, nearly dragged them up the steps again, out into the blinding sunlight. The mob, seated above, filled the air with hateful yells, and the encouraged guards beat them even more than before. They were led across the amphitheater until they arrived at an elevated and regal throne. The man sitting upon it stood. He had a royal demeanor, but his face was cruel, and Marcus knew there was no pity in Caesar’s heart. Just before the group was an altar, and to it the Emperor pointed. For a moment, silence filled the air. Marcus considered. If he did the simple thing that the Emperor asked him, he could go free. Maybe he could even see his mother and brother again. If he didn’t, he would be torn apart by lions. His heart raced, but then, he remembered what the old man, standing so calmly next to him, had said. Marcus felt courage well up in his heart, and he knew what he must do. He nodded firmly to the other believers. “We cannot accept his offer,” he said. The old man now spoke. “Jesus said that if we denied Him on earth, He would deny us in heaven,” and then he turned toward the throne. “We cannot accept your offer, oh most gracious Caesar,” he said, and the others said the same. Caesar’s visage was twisted with a look of disgust and anger. “Very well,” he said, and sat down. At that moment, the doors to the cages of the animals opened. Out leapt the snarling beasts, running wildly around the group, attempting to claw out of the arena. Seeing they could not do so, they then turned to the little band, now in the center of the arena. But, Marcus did not notice, and the cacophony of screams and roaring around him were drowned out, for his eyes were fixed to the sky. There, he saw the heavens opened, and Jesus holding out his hand. Angels swept down to him, and a peace filled his soul, just as it had just a few moments past. And then, it was over. A Voice spoke to Marcus, and he smiled, even as his body fell to the ground, bleeding. 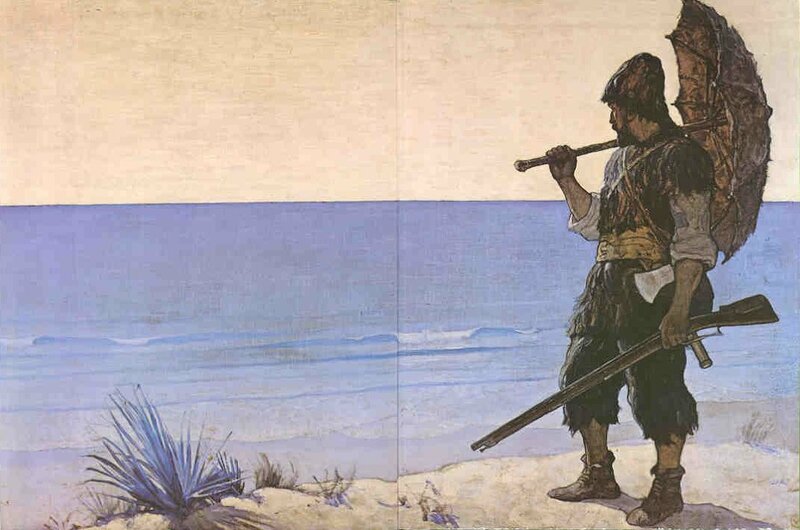 After having been shipwrecked, Robinson Crusoe took advantage of the fact that the ship was stranded out a short distance from the island. 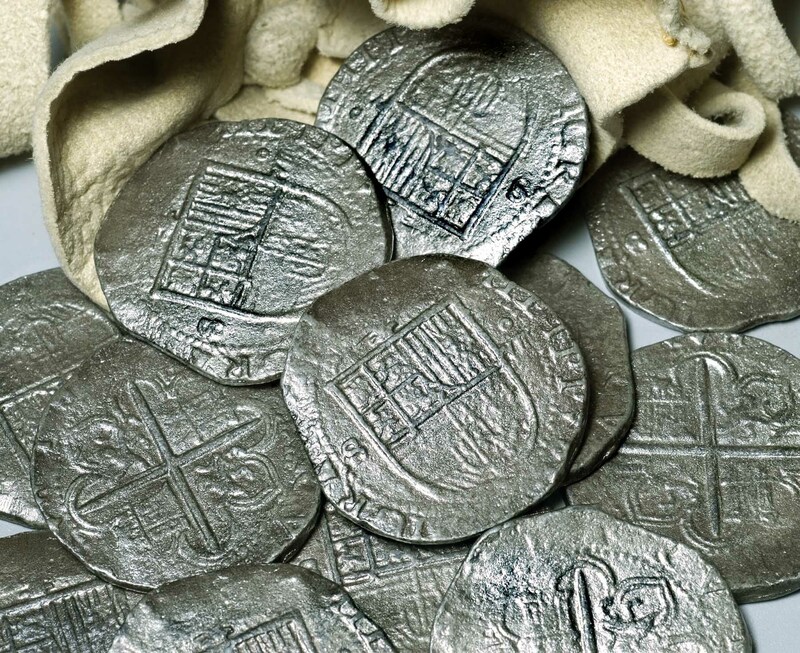 While he was searching through the ship, he found a heap of coins sitting in the ship. He recognizes the money is worth nothing to him. He is all alone, and even if there were savages on the island, they would not take gold and silver as payment for their services. If a ship came to pick him up, they would probably expect his gold as payment for delivering him, if they even bothered to do so. But he takes the money anyway. Why? The love of money is what got Crusoe in that predicament after all. He was sailing to Africa to get slaves and expected to return to his plantation and become rich. Was it old habit setting in? Probably. If I were to find money lying around, I would probably take it for sentimental value and a reminder of the civilization I had been raised in, or since it was coinage, to melt down and turn into something more useful, but it seems that the only reason Crusoe took the money was for the money’s sake. Robinson Crusoe. I remember reading this book as a little child, enthralled by the tale of a man who, against all odds, and all alone, with only what he could grab from a beached vessel before it sank, took dominion over his island, fought off savages, and most importantly, found his way back to God. Through all of the book, there is a reoccurring theme, the storms. There was a storm when he first went to sea; there was another on his second voyage, and the storm that resulted in his being cast on an uninhabited island. How important are these storms to the story? I believe I can say that they are probably one of the most important elements to his story. First, as an allegory. The physical storms he faced represented the spiritual storms Crusoe was experiencing. Also, the storms are borrowing from the the idea of Jonah, or the sailors in Psalms 107:23-30, who were faced by the seas, which were acting as the physical representation of the hand of God. Second, the storms give a crucial element of danger and adventure that would otherwise be lacking. The storms help get us to take far more interest in the story than we would of otherwise, and act as a very critical part of the story of Robinson Crusoe. 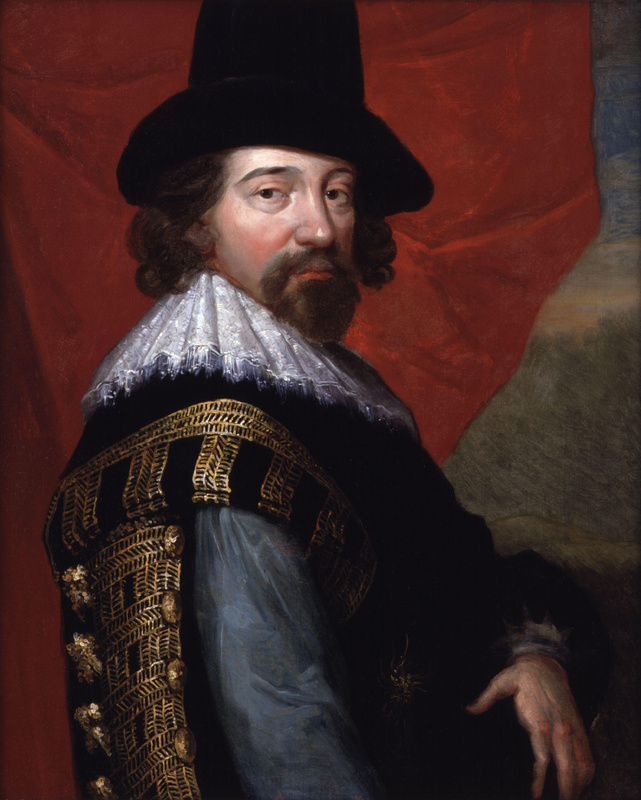 Francis Bacon was an English philosopher, statesman, and most notably, one of the first to use the form of the essay. Following in the footsteps of Montaigne, Bacon began publishing essays on various topics. One of his essays discussed his opinion of debt, and he even gave ideas as to how much of your income you should spend or save in order to increase your own wealth. However, his essay has no power to it, especially when you understand how he himself did the exact opposite of his own advice, and at his death was in debt £24,000, or £3m in current value. By the time he wrote the essay, he had already been disgraced and removed from his position as Lord Chancellor of England under James I, and so he had his own life as hindsight. The least he could of done would be to use his own example to spur the readers to follow his own advice, as he had experienced not following it and was suffering the consequences. But, since he did not do so, this essay is lacking, and probably not going to be persuasive enough to convince someone to not go into debt.